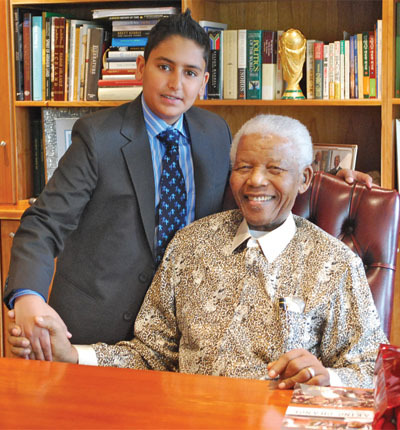 “I don’t know if I consider myself mature for my age but I definitely consider myself an average 13-year-old.” For someone who has shot the breeze with the likes of Nelson Mandela, Roméo Dallaire and Desmond Tutu, Bilaal Rajan is not your typical teenybopper; he’s not even your run-of-the-mill human being. He was just four years old when tackling global poverty became his playground. When I was that age, the idea of selling Clementine oranges door-to-door to raise money for earthquake victims in Gujarat, India, would never have crossed my mind as I pushed Barbie and Ken in a luxurious convertible Corvette across a laminate floor. Your childhood mentality was probably the same. Let’s be completely honest with each other: making a difference in the world is as far from many of our Western minds as a remote ocean island on the most extreme point of the Earth. It’s not that we’re oblivious to other people’s needs, it’s that we participate in the social phenomenon that is diffusion of responsibility, where we socially loaf around thinking that someone else is taking action. We are floaters. And it’s a long way down until our toes touch the ground. 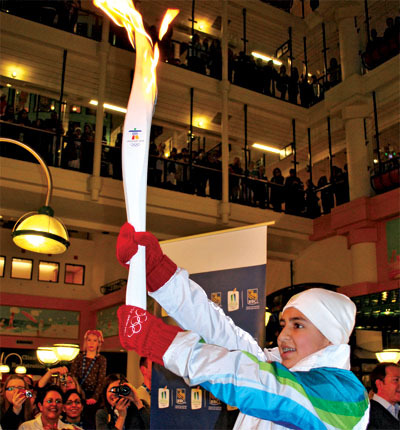 But we always have a choice, said Jean-Paul Sartre; and “I guess in my life I chose to do this,” says Bilaal Rajan, who recently carried the Olympic torch through the streets of Toronto. Sometimes we select to superficially put complaints of a bad haircut or breakup on the top of our lists. This, while some of the world’s inhabitants experience dark valleys of pain and devastation and a cup of dirt-stained water is more miracle than malady. 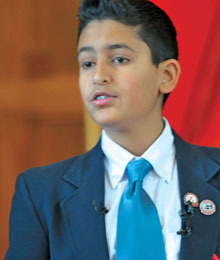 Richmond Hill, Ont.,s Rajan knows all about this, and at such a young age, he has already proved that age really is just a number. “So many people around the world don’t exactly have what we have here. I visit so many countries – 25 to date – and being able to see how other children suffer and seeing the different lifestyles between what we have here and how they live there is astounding. I’ve always wanted to help ever since I’ve been able to realize the difference it can make in people’s lives,” says Rajan, an only child whose relief efforts, fundraising feats and speaking events have propelled him to superhero status. As a children’s rights activist visibly concerned with the plight of Haitian children, the HIV/AIDS pandemic and climate change, he has raised thousands of dollars for The World Partnership Walk and millions as the official child spokesperson for the United Nations Children’s Fund (UNICEF), an organization that procures continuing humanitarian and developmental aid for children and mothers in developing countries. 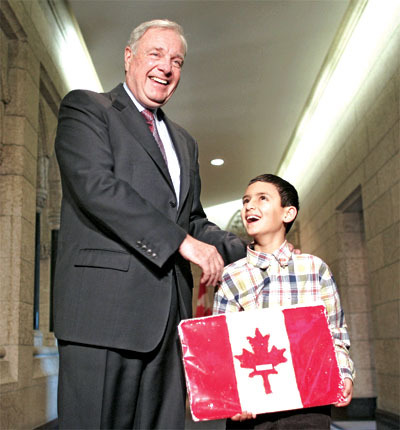 In 2004, he developed the UNICEF Canada Kids Earthquake Challenge, inspiring Canada’s youth to participate. “Children are the future of the globe today. In the next 50 years, someone who will be the next president or prime minister or any other political leader is someone who is a child today,” says Rajan, a mover-and-shaker who summers in the Maldives and Tanzania – where in 2006 life expectancy at birth was 50 years – to educate people about HIV/AIDS. “Be the change you want to see in the world,” reflects Rajan on his favourite Mahatma Gandhi quote. 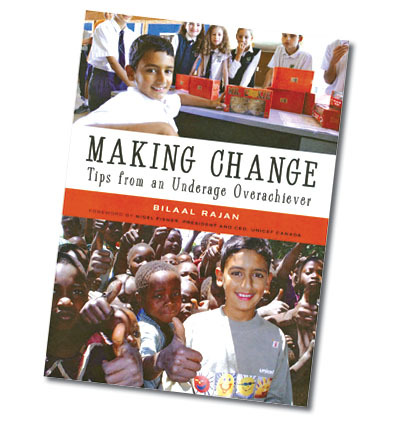 Those words inspired him to pen his self-created destiny with Making Change: Tips From an Underage Overachiever (Orca Book Publishers, 2008). “The book reveals all the actions I take each and every day of my life.” When he’s not saving the world, Rajan finds time to spend with family and playing with schoolmates. After all, he is just your average 13-year-old.